Locations of key events during Saturday's spree. A carjacking crew struck three times in about an hour across Lakeview and Lincoln Park on Saturday morning, police said. They succeeded in taking one vehicle, but two other drivers managed to foil the auto thefts. One of the drivers who saved their cars was robbed of her personal property instead, according to reports. 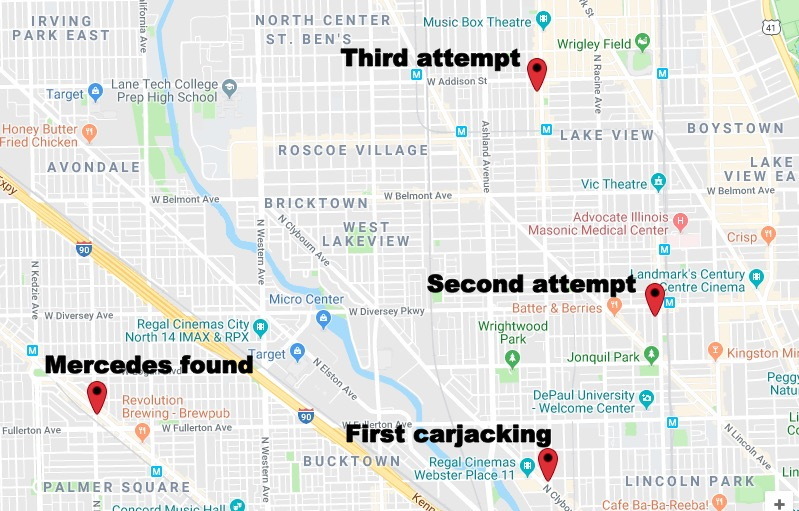 A vehicle wanted in connection with the carjackings was later spotted by officers in Lincoln Park, but police supervisors ordered the unit to terminate its pursuit of the suspects. No one is in custody. Police said the first carjacking happened at 7:05 a.m. in the 1400 block of West Webster. A 29-year-old delivery driver was in his car when an armed man approached and ordered him out of the vehicle. The offender was accompanied by at least two men who were in a white Mercedes SUV, according to police. A witness reported that the delivery driver had pulled over to get something from his trunk and determine where he needed to go when the offender put a gun to the man’s head and took his personal belongings and the delivery van: a white Dodge Caravan with license plate AB45546. The primary offender was described as a black man between 20- and 24-years-old who stands about 6-feet tall. About 30 minutes later, a 62-year-old woman was forced out of her car at gunpoint by a masked man who emerged from a white Mercedes SUV in the 3500 block of North Southport and pointed a gun at her. The offender was unable to get the woman’s car into gear, so he took her purse and got back into the Mercedes which fled eastbound on Eddy Street, according to police. The gunman was described as a black man between 25- and 40-years old who stands about 6-feet tall and weighs 180 to 190 pounds. He was wearing a black ski mask, a black jacket with no shirt underneath, and dark pants. Finally, at 7:55 a.m., a man who had just parked his car in the 2700 block of North Sheffield was approached by a man who pulled a black handgun from his waist and ordered him out of the car. The victim, 20, was able to pull his keys out of the car, which prevented the carjacker from driving away. The offender returned to the white Mercedes which sped from the scene. The Sheffield gunman's description closely matched that of the offender on Southport, except this time he was shirtless and the victim could see that hew as wearing a Gucci belt with a large GG on the belt buckle. Minutes after the last carjacking attempt, officers in the 18th (Near North) Police District spotted the white Mercedes and engaged it in a brief chase westbound on Fullerton. A police supervisor ordered the officers to terminate the chase as it approached Fullerton and Milwaukee. The car was later found abandoned in the 2400 block of North Milwaukee. Police believe the SUV was stolen from a business that is located in the 200 block of North Green Street in the West Loop.